Mulled Wine Concerts — Kapiti’s vibrant concert organisation headed by pianist Mary Gow — will put on a special event to kick off their 2019 season. 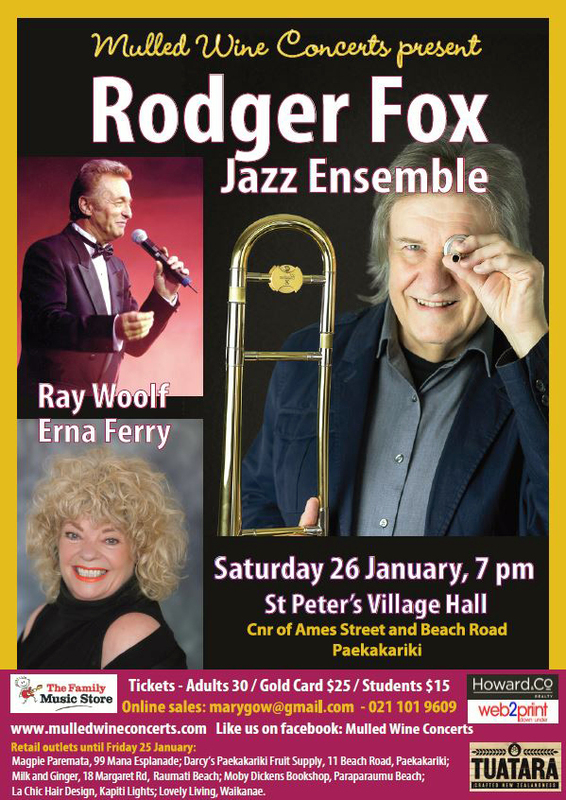 This concert, featuring three giants of the New Zealand music scene – Ray Woolf, Rodger Fox and Erna Ferry — will happen at the historic St Peter’s Hall in Paekakariki on Saturday 26 January 2019. Ray Woolf’s appeal crosses generations with a musical CV that includes pop, rock, soul, cabaret and jazz, while his television career ranges from drama and soap opera to fronting Play School and his own talk show. Mums, dads and grandparents love him and even those with little interest in music will remember him as the guy with Howard Morrison on the Bic television commercials. In 1980 he began his association with musical theatre starring in Hans Christian Anderson, The Music Man, The Sound Of Music (100 performances so far) New Rocky Horror Show, West Side Story, A Slice Of Saturday Night, Blood Brothers, Golf the Musical and later this year the King in The King and I. For 43 years Rodger Fox and his big band have set the benchmark for jazz in New Zealand [Roger had his music shop The Golden Horn off Cuba Street at least as far back as 1974 —Eds]. Unlike many jazz musicians who’ve gone offshore, Rodger has stayed here to offer his gift of performance, arranging, administration, conducting and teaching. Tickets: $30 adults, $25 Gold Card and $15 students. Info: http://www.mulledwineconcerts.com, or like on FaceBook: Mulled Wine Concerts. Pre-sales until 25 January: Magpie Paremata, 99 Mana Esplanade; Darcy’s Paekakariki Fruit Supply, 11 Beach Road, Paekakariki; Milk and Ginger, 18 Margaret Rd, Raumati Beach; Moby Dickens Bookshop, Paraparaumu Beach; La Chic Hair Design, Kapiti Lights; Lovely Living, Waikanae. Limited door sales on the night.